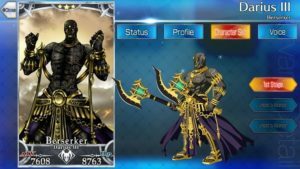 THIS ARTICLE CONTAINS THE STATS, STRATEGY, AND GUIDE FOR Darius III. WE WILL UPDATE THIS AS SOON AS THE GAME COMES OUT. 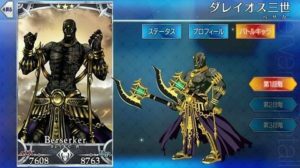 This article contains the skills, abilities, ascension items, and strategies for Darius III in Fate Grand Order [FGO]. We plan to update this as more servants come into play. 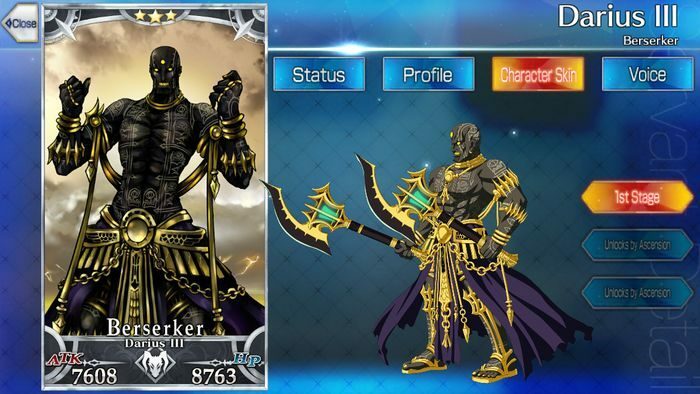 A decent 3 Star Berserker Class servant given his low Cost making him versatile, he fulfills a passable role since his NP deals a fair Area-of-Effect to a group of enemies during the early stages. 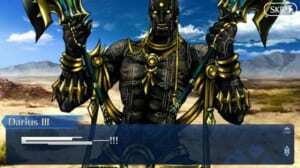 Given his class, Madness Enhancement B strengthens his NP when performed in a chain. Given that Berserkers are quite frail, he fares decently due to Battle Continuation, which provides some longevity when in dire straits. When aiming to execute Anathon Ten Thousand, consider preparing a Brave Chain prior to unleashing his NP. Due to the higher ATK offered by his NP, it serves best for a late-game sweep. In other words, it can finish off weakened enemies later on. Prioritize on reinforcing Battle Continuation since it is capable of turning the tides of battle. 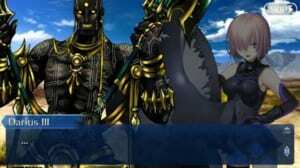 He pairs well with other Berserker Class servants such as Heracles and Kiyohime. Having another Berserker or at least other servants with multiple Buster cards will aid him deplete the enemy forces. Mash Kyrielight can soften the incoming damage, allowing him to survive longer. Altria Pendragon not only aids him in forming Buster chains but also grants him Charisma to increase his attack further. Zhuge Liang can help him quickly fill up his Noble Phantasm bar, allowing him to deal def-ignoring damage towards enemies. The rare Limited/Zero Over is a good staple Craft Essence for Berserker Class servants as it boosts their Cards’ effectiveness, allowing them to take advantage of their high Buster Card count through chains. If you could not afford this CE, the 3 Star Buster CE Crimson Black Keys works as a low cost, yet decent alternative. Verdant Sound of Destruction can also offer Darius III hitting power similar to that of Limited/Zero Over. If the player wants to grant him more sustain, Nightless Rose may be an option. Because he has one battle continuation, having another may give him a chance to survive against tougher enemies. 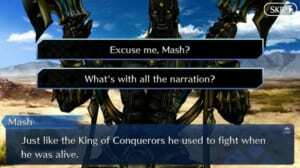 If you’re looking for Darius III’s Interlude Quest, click here. Golden Rule B 3 8 Raises self’s NP generation rate. Disengage A 7 Dispels self debuffs. Decreases all enemies’ Attack and Defense for 3 turns. Hailing from Ancient Persia, the fearless prince who rose above the ranks and later occupied the new seat as king Darius III. Deemed as the brute force that rages against the Macedonian army, and arch rival of Iskandar who prevented his passage in countless encounters. Known for being a force to be reckoned with, it contrasts his default reaction who is shown to have a calm countenance. His fighting spirit is unshaken, on the battlefield he does not simply storm at the enemy, rather he is defined as the storm personified. Unfortunately his persistence did not pay off. Eventually, Iskandar conquered the Achaemenid Empire. However before Iskandar could reach him, the Macedonian king already found the king dead. The story goes that he had been slain by his cousin, a fellow satrap. As a Heroic Spirit, he demonstrates faithfulness to serve his Master, following commands whenever he’s ordered. His desire for the Holy Grail is to cross paths again with Iskandar, not by duel, but pitting them against each other while on the field accompanied their army.